HTC HD7 Scheduled for mid-October Release? Home > HTC > HTC HD7 Scheduled for mid-October Release? There has been plenty bandied about regarding the HTC HD7 and now comes a leaked spreadsheet from German carrier O2 that pins the release date to 42nd week of the year. That dovetails nicely with previous rumors of an October 18th release in the UK. 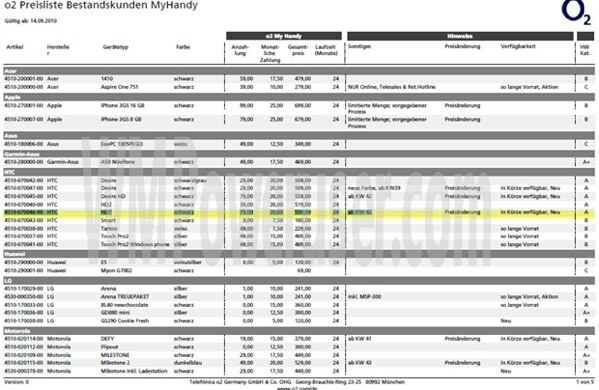 According to the document, the HTC HD7 will be €79 on a two year €20 monthly contract, and €559 without a contract. As for the US, the HTC HD7 is rumored to be coming to T-Mobile. Come mid-October, it sounds like we’ll have no shortage of new Windows Phone 7 phones cropping up. Of course, we encourage our readers to sign up now for our Windows Phone forums. Get in now before the rush. These prices €79 + €20/month on a 2 year contract aren’t even half bad. I’d have expected them to be higher. But most likely T-Mobile will have all sorts of bundles which you can add (or rather can’t afford not to add) to drive up the monthly price. I am however put off by the €589 unlocked price. Who changed O2 to T-Mobile in my comment?